In case you’re wondering how we ranked out top careers, take a look at this article. A lot of thought went into the process. We hope you’ll find our career rankings a good place to start when trying to decide on a career. 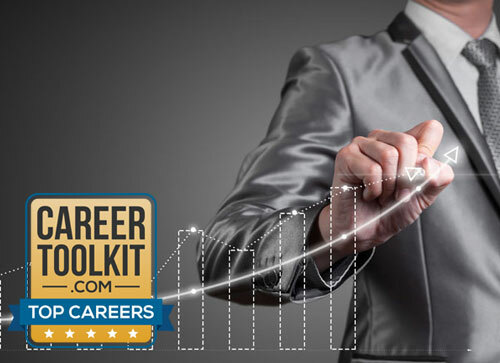 Since the CareerToolkit.com ranking system relies heavily on data and statistics like salary and job outlook, we created a list of the careers with the highest salaries and the highest job outlook first. Our list was started by pulling all the careers paying a median of $50K a year or more from the U.S. Bureau of Labor Statistics (BLS.gov) website. We also pulled all the careers with a job outlook of 7% or more from BLS.gov. In addition, to make our research more complete, we reviewed popular careers and added in any popular careers not already on the list. By focusing on popular careers, higher paying careers, and careers with a high job outlook we rounded up over 200 careers that were good candidates for our best careers list. Once we had the careers selected, we began the process of deciding on the criteria used to assess them. We did not want our career rankings to be based on subjective criteria. Someone may like making phone calls all day, while another would rather have a more solitary job. Someone may like the physicality of a construction job while another may like sitting at a desk. These are all subjective criteria since not everyone feels the same way about stress, physicality, public speaking (even just making phone calls) and other subjective criteria. It’s all based on your opinion of what’s better so we left subjective criteria out of our rankings as much as possible. Instead we chose the following criteria; median salary, salary potential, job outlook, employment numbers, change in employment, and typical education required. We felt these were solid fact-based criteria for calculating the best careers. For example, nearly everyone would agree that a career with a higher salary is better than one that barely pays above minimum wage. Once the criteria were chosen, we got to work assigning points. A higher number of points overall indicated a better career. The breakdown of points is touched upon below. The median salary from the U.S. Bureau of Labor Statistics was used as the salary indicator in the CareerToolkit.com rankings. The salaries were broken up into 6 different categories that ranged from less than $29K a year to over $120K a year. Points were assigned for each category. More points were awarded for careers paying a higher median salary. The difference between the highest 90% and lowest 10% pay (from the U.S. Bureau of Labor Statistics) was used as the salary potential. The salary ranges were broken up into 6 different categories; the spans ranged from less than $29K a year to over $120K a year. Points were assigned to each career depending on which category the salary range for that career belonged in. More points were assigned for higher salary ranges as this indicates a career where there’s more potential for an individual to increase their earnings. The job outlook came from the U.S. Bureau of Labor Statistics which is indicated as a percentage (either a positive or a negative percentage). Once again, there were 6 categories with points assigned to each. The categories ranged from -1% or less to over 24%. A higher job outlook resulted in more points since a higher job outlook represents growth in that particular career. Employment numbers came from the U.S. Bureau of Labor Statistics. We pulled the number of jobs in 2014 for each career. Six categories were chosen ranging from 5,000 jobs or less to 200,000 jobs or more. A higher number of points was given to careers with more jobs since this is an indicator of demand in that career. For example, a career with high pay and a high job outlook should score higher in the rankings. However, if that career only has 1,000 employees in the U.S. then it should receive a lower score than a high paying career with a high job outlook that has 100,000 employees. This way, the rankings were able to take into account the size of the jobs available for any given career. Employment change indicates the projected change in employment from 2014 to 2024 and was collected from the U.S. Bureau of Labor Statistics. Six categories were created ranging from those with a negative number to 100,000 or more. Careers with a higher projected change in employment were awarded more points. The typical entry-level education was collected from the U.S. Bureau of Labor Statistics. Of the six ranking criteria, the typical education required could be considered subjective since not everyone feels the same about attending school. However, the fact is, getting more education costs more in both time and money and therefore should be factored into the rankings. In addition, ranking with education is complex because you can’t just assign points based on a sliding scale like ‘years in school’ because high paying jobs with a high job outlook that only require a High School Diploma have more competition. Therefore, points were assigned based on the different educational requirements for the careers in the list. For instance, careers requiring a Bachelor’s degree or an Associate’s degree were given the most points while a career only requiring a High School Diploma was given the least number of points. There is no barrier to entry in a career only requiring a High School Diploma which will result in it being seen as attractive to many people and therefore competitive. A career requiring a Doctorate or professional degree was given a fairly low number of points due to the cost and time commitment of gaining this advanced degree. The points were totaled up and are included in the top careers lists. If you review the scores, you’ll see that ties are common. Ties were handled by salary tiebreakers. For example, if 3 careers received a score of 68, they were scanned for their salaries. The career with the highest salary as indicated by our salary categories would win the tiebreaker. If more than one of the careers had salaries that all fell within the same category, we moved onto a tiebreaker based on the salary potential. Again, the careers were examined based on the salary potential categories and not just the raw numbers. If more than one of the careers fell within the same growth potential category, then we moved onto the job outlook. If more than one of the careers fell within the same job outlook category then we moved onto the change in employment. All tiebreakers were settled by the time we reached change in employment if not earlier in the tiebreaker process. See the top 100 careers and find the right career for you.